Clovis population decline at Younger Dryas? Recent evaluation by the author of the South Carolina Paleoindian point database indicates the substantial presence of a suspected Middle Paleoindian point historically known as Redstone (Cambron and Hulse, 1964; Mason, 1962; Perino, 1968; Williams and Stoltman, 1965). 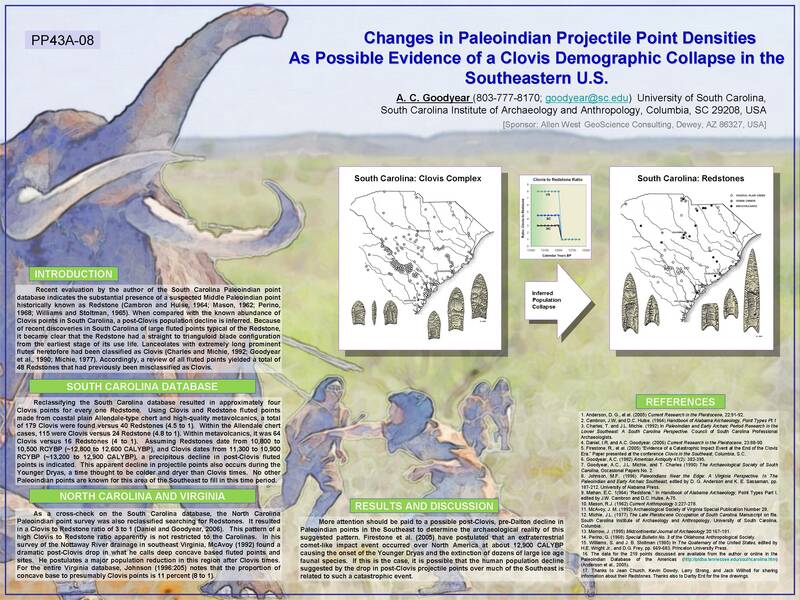 When compared with the known abundance of Clovis points in South Carolina, a post-Clovis population decline is inferred. Because of recent discoveries in South Carolina of large fluted points typical of the Redstone, it became clear that the Redstone had a straight to trianguloid blade configuration from the earliest stage of its use life. Lanceolates with extremely long prominent flutes heretofore had been classified as Clovis (Charles and Michie, 1992; Goodyear et al., 1990; Michie, 1977). Accordingly, a review of all fluted points yielded a total of 48 Redstones that had previously been misclassified as Clovis. New Paper: Sea Level jump at onset of Younger Dryas?